A marketing agency job is exciting, challenging, and immensely rewarding – professionally and financially. But is it the right job for you? And if it is, what can you do to make your resume stand out? As among the largest employers of marketers, copywriters, and designers, marketing agencies get flooded with resumes. The hyper-accelerated learning environment and generous salaries draw some of the best in the industry to compete for a few jobs. Standing out in this competitive field can be hard. You need strong domain expertise as well as a handful of ancillary skills. 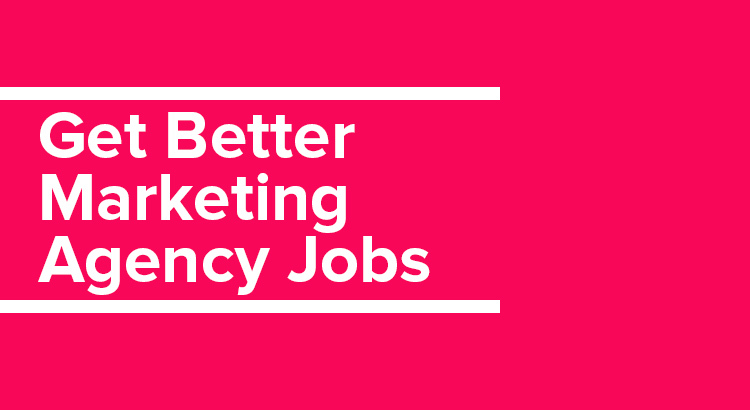 In this guide, I’ll share everything you need to know about marketing agency jobs, and what you can do to increase your chances of landing one. Thanks to the mythical status of folks like David Ogilvy, Leo Burnett and the fictional Don Draper, most people are already familiar with advertising agencies. Some of you might even know what ad agencies do – produce ads, and charge a fee on the media placements. Marketing agencies, however, are different beasts. Even though there are thousands of them spread across the world, most laymen don’t fully understand their role and purpose in modern businesses. So let’s start by answering some fundamental questions: what is a marketing agency? What does it do? A marketing agency is exactly what the name describes: an agency (i.e. a collection of individuals) that helps businesses with their marketing. An agency recruits people with a wide range of expertise and organizes them into teams. A marketing agency team might have a marketer, a designer, a PR specialist, and a copywriter on board. The agency will “rent” out this team for a fixed hourly price (or less frequently, a monthly fee) to businesses to help them meet their marketing goals. These goals can be broad (“get more traffic”) or incredibly narrow (“capture high-interest leads from affluent customers in the 30-45 age range). The marketing agency can use any number of approaches to meet these goals. It can create content (i.e. content marketing), place ads on Google (i.e. PPC – Pay Per Click), or use social media (i.e. social media marketing). Sometimes, they use a combination of all these approaches. But more often than not, they focus on a specific marketing area. This focus defines what category the agency falls into – content marketing agency, social media marketing agency, PR agency, etc. Thus, you can think of “marketing agency” as a broad category that has several sub-categories of agencies. Ad agencies, PR agencies, content agencies, etc. all fall under the umbrella of “marketing agency”. 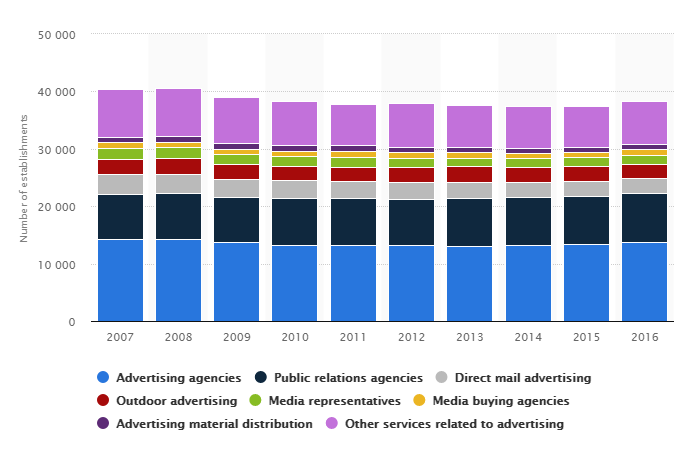 The number of such agencies has been steadily climbing in the US after in the last few years. As of 2016, there were nearly 40,000 agencies in the country with ad agencies forming the largest share (13,800). Thus, a marketing agency can be said to be a collection of domain-specific experts who help businesses reach their growth goals. Now that you know what a marketing agency is, we can move to the more serious business of applying for marketing agency jobs. The competition for these roles is immense. You’ll be fighting against experienced agency hands, skilled freelancers, and fresh graduates with prestigious degrees. Standing out isn’t just important; it’s necessary. In any business, you’re much better placed to serve your employer once you actually understand how they make money. This will enable you to position yourself better to meet the business’ needs and thus, become a more valuable employee. Plus, it will also help you negotiate your salary better. The agency’s account manager and marketers create a plan to help the client meet this requirement. Based on this plan, the agency creates a project team. This team might include multiple designers, copywriters, or marketers depending on the project’s needs. The agency charges the client an hourly fee for each employee, plus the cost of any materials (such as camera film). This hourly fee includes your salary (expressed in hourly figures), the agency’s operational costs, and its profit margin (between 10-20%). Your salary is based on the assumption that you’ll be productive 70% of the time (called your “utilization rate”). If you can show employers that you have higher productivity or have skills across multiple disciplines (thus eliminating the need to have larger teams), you will stand out. After all, what agency doesn’t like the idea of hiring fewer people? One of the easiest ways to get rejected from a job is to apply for one that’s outside your experience or expertise level. This is why it is helpful to understand how marketing agencies are organized. Who reports to whom? What kind of authority do managers, directors, and VP-level people have? The two big functions in any marketing agency are accounts and creative. Accounts deals with all client-facing aspects of the agency business – winning accounts (i.e. clients), handling client communication, and making sure that clients are happy. Think Pete Campbell from Mad Men. Creative, as you expect, handles all project-delivery focused aspects of the business. This includes design, copywriting, strategy, etc. Think Mad Men’s Don Draper. Of course, there are other functions as well – accounting, human resources, business development, etc. But in most agencies, accounts (people who get clients) and creative (people who serve clients) call the shots. Keep this in mind when you’re applying for marketing agency jobs. In terms of organizational structure, agencies are a mixed bunch. 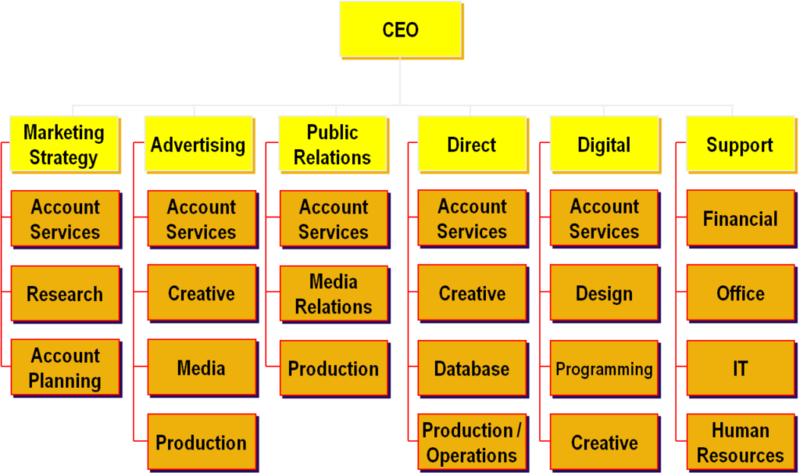 In the traditional model, each division (such as PR or media) would have its own head. The division would be further divided into accounts and creative teams. Each project would be managed by an account manager who would select a team to work on the project. A single team might work on multiple projects at the same time, often under different account or project managers. Of course, different agencies will have different models. Some might organize their business around project teams. Others might do it around specific clients. But the general structure remains largely the same. Keep this in mind when you’re applying for marketing agency jobs. Make sure that the job you’re applying for matches your education and experience. The hardest part about applying to a marketing agency job – or any job for that matter – is being objective about yourself. It’s human nature to be biased in favor of your own skills and experience (in some cases, the other way around as well). We all think we know more or have worked harder than we actually have. This often leads to people applying for roles they aren’t really a good fit for. Even if you do get hired, being unfit for a role will make everyone unhappy – you, your clients, and your employer. So before you start applying, do an objective, dispassionate evaluation of your skills, capabilities, and experience. Expert: Your primary domain expertise. These are skills you can do with your eyes closed – and get paid for. Intermediate: Your ancillary skills, i.e. things you are good at but need to consult experts for really tough problems. Beginner: Skills you have a cursory knowledge of, but are nevertheless familiar with. Also specify which of these skills you have any formal experience or education for. If you majored in graphic design at college, you can rightfully call yourself an “expert” at design. If you completed a 3-month crash course in web design, you might call yourself an expert if you followed that up with 3 years of web design work experience. Else, you can at least call yourself an intermediate-level web designer. Similarly, evaluate your experience. Marketing, design, coding are all rapidly changing fields. Can you really claim to be “experienced” if you’ve had just 2 years of working in the field? Keep this in mind when you apply for different marketing agency roles. Agencies prefer people with ‘T-shaped’ skills, i.e. 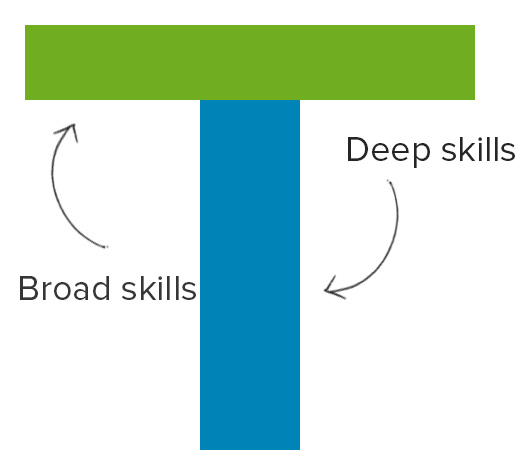 expert-level knowledge of one domain, and intermediate-level ancillary skills. Communication: Do you have any writing experience? Do colleagues and bosses have an easy time figuring out what you’re trying to stay? Do you respond to emails on time? Organization skills: Working in a fast-paced agency means keeping on top of several things at once. Evaluate how well you organize everything – your inbox, to-do lists, short-term and long-term goals, etc. Handling deadlines: If there is one thing you can’t do in agency work is be late. Ask: how good are you at meeting hard deadlines? Are you habitually tardy, or can you walk the extra mile to finish things on time? Personality: Working in a marketing agency isn’t for everyone. The breadth of creativity and high-pressure environment can quickly become hard if you don’t have the personality for it. Ask yourself: are you happy working with demanding clients? Do you like working in large teams? Are you detail oriented or are you a “broad vision” guy? Remember that the best job is one that fits your skills and personality, not the other way around. This evaluation exercise can be tough, but you’ll be better off once you do it. As overused as the word “hustle” is, it is also essential for landing top marketing agency jobs. The competition for these top jobs is too immense to be just another candidate; you have to do something more to stand out. This article by Ina Herlihy is a great example of what hustle means in the context of marketing jobs. You have to be willing to network aggressively, undertake projects of your own, and persist until you land the job of your dreams. Create a list of target marketing agencies. Send them pointed advice on how you would help them, or their clients grow. Create a project for your target agency, such as a redesign of their website or a reinterpretation of their recent client work. Go to events attended by marketing agency employees and founders. Create custom visiting cards to indicate that you’re currently in the job market. Tap into your broader network and ask people if they’re looking to hire. Email senior leaders, even C-suite executives, your ideas to help the agency grow or serve its clients better. 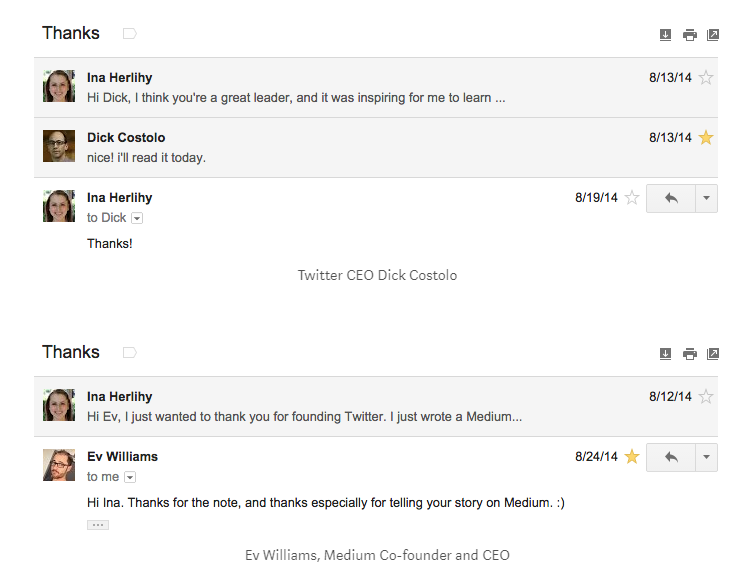 Ina Herlihy, for instance, emailed people as high up as the CEOs of Twitter and Medium – and even received responses. Go beyond the traditional resume and create something that helps you stand out. A great example is this resume by Nina Mufleh for Airbnb (which eventually got her interviews at both LinkedIn and Uber). The bottom line is, you have to look to add value before you get hired. The more value you can offer employers before they even shortlist you for interviews, the better your chances of landing top marketing agency jobs. The final part of the marketing agency job application process is something you already know: create a good portfolio, update your resume, and write a smashing cover letter. Yet, so many applicants skip these crucial steps. They’re so focused on doing the unexpected that they forget to get the expected parts right. So before you start sending in your application, remember to cross your t’s and dot your i’s. Portfolio: Re-organize your portfolio to show your latest projects. Change the portfolio slightly depending on the job you’re applying to (for instance, place your car-focused work upfront if the agency works a lot with automotive clients). Also make sure that the portfolio is easily accessible – use online platforms like Behance instead of PDFs. Resume: While you can – and should – have more creative, interactive resumes, it doesn’t hurt to have a standard resume as well. Make sure that you update it with your latest work-experience and projects. Also make sure that the resume is easy to read and access. Cover letter: Don’t just send the same cover letter to everyone. Instead, personalize it for each company you’re applying to. Do your research and make sure that the letter references the agency’s services, clients, and history. Social media profiles: Employers will inevitably look at your social media profiles and website (if you have one). Make sure that you have an active presence on the popular channels – Twitter and LinkedIn. If you can, also create a website that has an interactive version of your resume and portfolio. Your goal should be to have a visible and well-crafted brand before you even start applying for marketing agency jobs. The better your brand, the more you’ll find that opportunities come your way. Landing a marketing agency job can be tough. The competition for top roles is immense and you have to fight hard to stand out. The good news is that if you do your homework, you will be far ahead of most of your peers. By creating a visible personal brand, expanding your network, and adding value to your employers, you will have a far better chance of getting the agency job you’ve always wanted. Of course, it also helps to look in the right places. 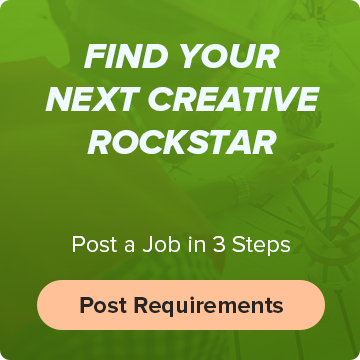 Platforms like Workamajobs can help you find creative agency jobs that might not be advertised elsewhere. 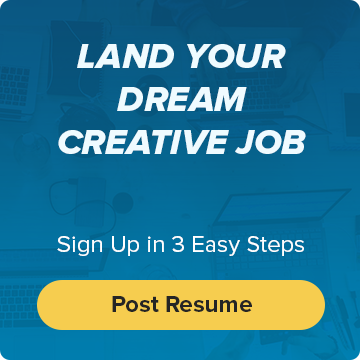 Just create an account, upload your resume, and start applying to the world’s top agencies.